A wintry twist on the classic Bakewell with rich walnuts and unusual medlars. For the tart, line a deep 23cm/9in tart tin with the sweet shortcrust pastry. Place a sheet of baking paper or foil over the pastry and weigh down with baking beans or rice. Place the tart tin onto a baking sheet, transfer to the oven and bake for 15 minutes. Remove the paper or foil and baking beans from the tart tin, then return to the oven for a further ten minutes until the pastry is lightly golden-brown. Remove from the oven and allow to cool slightly. Place the butter and sugar into a bowl and beat together until light and fluffy. Crack in the eggs, one at a time, mixing well between each addition. Add the ground walnuts and breadcrumbs and fold together until well combined. Spread two thirds of the damson jam over the base of the pastry case. Cover with the walnut filling mixture and smooth the top using a wet palette knife. Place the walnut halves around the edge of the filling. Transfer to the oven and bake for 25-30 minutes, or until risen and golden-brown. Remove from the oven and allow to cool slightly. 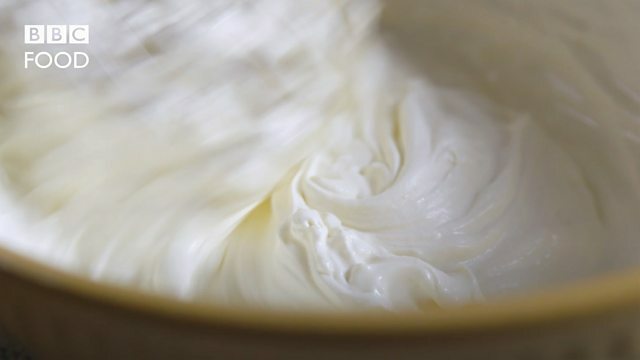 Meanwhile, in a bowl, whip the cream until soft peaks form when the whisk is removed. Fold in the remaining damson jam. For the roasted medlars, heat the butter in an ovenproof frying pan and fry the medlars for 1-2 minutes. Add the sugar and cinnamon stick, then transfer the pan to the oven and roast for 10-15 minutes, or until the medlars are soft and the skins have split. To serve, cut the tart into slices and place onto serving plates with a spoonful of damson cream and some roasted medlars.